Need a florist to send beautiful fresh flowers to North Shore Private Hospital? Our award-winning flower shop offers same delivery if you order by 11am weekdays and 9am Saturdays. Need a florist to send gorgeous flowers to the North Shore Private Hospital. Pure Flowers is here to help! We hand-select the most gorgeous fresh blooms from the Sydney Flower Market and use them to create stunning vase arrangements, bouquets and pretty posies. 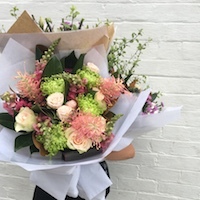 Whether its get well soon, congratulations or 'I am thinking of you' we can deliver gorgeous fresh flowers from our award-winning florist to North Shore Private Hospital. Place your order by 11am weekdays and 9am Saturdays for same day delivery. Ordering is easy – shop online, call 02 9427 8214 or visit our boutique store in Lane Cove. Pure Flowers is a boutique florist just a few minutes from North Shore Private. Ludmila and Elen, as well as our friendly and talented team, delight in creating personalised arrangements to help you celebrate life’s special moments. We hand-select the loveliest blooms from the Sydney Flower Market to create the freshest bouquets and floral designs for every occasion. We have a wonderful selection of flowers for you to choose from - luxury rose boxes, bouquets and florals in a vase. Whether you call or buy your flowers online, our team will create your order in our floral boutique. If you need some more ideas, read our our blog for the best flowers for a hospital bedside. And read our flower care tips so that flowers can be enjoyed for longer when they are brought home. 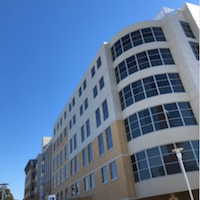 The hospital is located on the lower North Shore of Sydney. 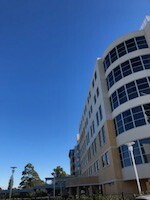 It is next to the Royal North Shore Hospital and TAFE NSW. It's a ten minute walk from St Leonards Station. Most wards accept flowers with the exception of ICU.